This classic "Action-Fantasy" story of good verses evil, friendship and sacrifice, is a rousing, adventure tale that brings Tolkien's novel, The Fellowship of the Ring to life. In the world of the mystical, magical middle earth, a young Hobbit Frodo Baggins, with the help of a wizard, his fellow Hobbit friends, and 4 warriors, sets out on a dangerous journey to throw an evil, all powerful ring into the fires of Mount Doom, to defeat an evil presence, threatening to destroy all the communities. 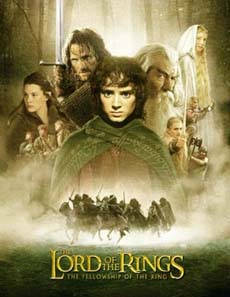 The cast includes: Elijah Wood, Ian McKellen, Viggo Mortensen, Sean Astin, Liv Tyler, Sean Bean, Cate Blanchett, Ian Holm. Hugo Weaving, Orlando Bloom, Christopher Lee, John Rhys-Davies, Billy Boyd, Dominic Monaghan, and Andy Serkis.